Now I may have mentioned this before, but my daughter is on a bit of an ice cream overdose right now. She's gotten tired of the fancy schmancy pints and really just wants to go back to the basics of vanilla, chocolate and strawberry (and cookie dough... and cookies n cream...). Anyway, this review will be part of our underlying back to basics series as we intermix all the awesome pints that keep showing up on my doorstep with some of the classics we all rely on from time to time. This is Blue Bunny Premium Neopolitan Ice Cream. 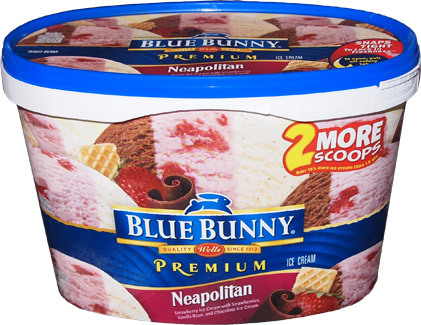 I emphasize Premium because I didn't realize that they also make Original Neopolitan Ice Cream which has a little less fat, a little less sugar, and comes in an old school rectangular cardboard container (sorry, it's not a half gallon). Unlike a traditional (evenly divided) neopolitan, Blue Bunny is rocking a much more random looking pattern. In fact, working through this container reveals that blue bunny cheats by running chocolate and vanilla up the sides and then squirting strawberry in the middle. Or in other words, the strawberry section gets smaller as you go down and is in fact non-existent at the bottom, which kind of stinks for me because it's actually my favorite part. Now that's not to say that the vanilla isnt nice, it's plenty good enough for a main stream brand. Sure, technically I'd love a bit more vanilla flavor since you can never really have too much vanilla flavor, but it's good, no real complaints because they are using vanilla bean and not fake vanillin.... no, I'm saving my complaints for the chocolate. There's just something unsettling about it. The vanilla and strawberry are nice and pleasant and then the chocolate hits you with something... iunno. I just don't like it. It's too strong or something. It's not fake, but it's potent and just doesn't fit with the other two. This may seem like a dumb question but I ask it in all seriousness because I have never had Neopolitan ice cream before. 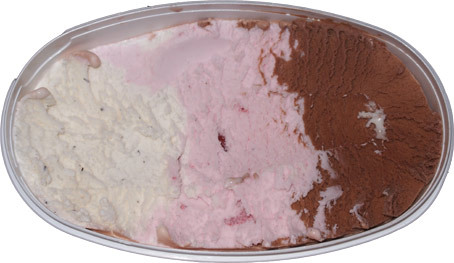 Are you supposed to eat the strawberry ice cream, the chocolate ice cream, and the vanilla ice cream separately? Or.. Are you supposed to let it melt all together so the three individual flavors blend into a single flavor? Or.. are you supposed to mix and match however you wish, such as combining just the chocolate with just the vanilla on one scoop, and then on another scoop, combining just the chocolate with just the strawberry, and on the third scoop, combining just the strawberry and just the vanilla? it's free choice really, either go at them individually or mix and match, it's all good and all fun. I usually do mix and match for a bit then smush up the second half for a nice choco-berry milkshake.